TORONTO, ON – Steam Whistle Brewing has announced details of its 3rd annual Oktoberfest celebration on September 21st, as well as a contest that is being held to give away several VIP ticket packages. One winner each from Ontario, BC and Alberta will be awarded airfare and 2 nights accommodation for two in Toronto, 2 tickets to Oktoberfest at the Steam Whistle Roundhouse, a beer tasting and private tour of the brewery, and “Meet the Makers” dinner with Steam Whistle co-founders, and more surprises. Entry information and more details can be found on the Steam Whistle website and Facebook page. 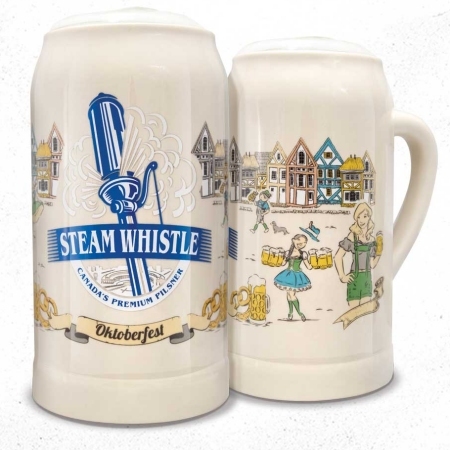 And for those not lucky enough to win the contest, admission to Steam Whistle Oktoberfest will be $25, which includes a souvenir 1 litre ceramic stein with its first fill of Steam Whistle Pilsner, traditional Oktoberfest food and live entertainment. A nice malty, lightly spiced lager with a salty pretzel, yum! Typically good quality sour from CA, although as can happen with multi-fruit beers, the flavours are a bit lost amongst each other.